Vorzüge [plural]: Advantages; Merits; Preferences. Clever name for a high-end boutique amplifier manufacturer, please tell me more. Well, their website maybe holds the answers? Pictures seem to have been uploaded in August of 2011. Okay. It’s been out a while. Why so little buzz? Stock photos of a studio mixing table, close-up shots of headphone amplifiers and black & red & white as far as the eye can see. Have I entered Knight Rider’s headphone blog? Click-click. Silver solder with gold compound. Gold plated PCB. Sure, I’m probably part of the correct demographic audience – having all sorts of cables, amps and headphones around the house – but that wasn’t really the information I was searching for. How do they sound? But another little part of me (the one that makes my fiancé say “Another headphone amplifier? !”) was aroused. 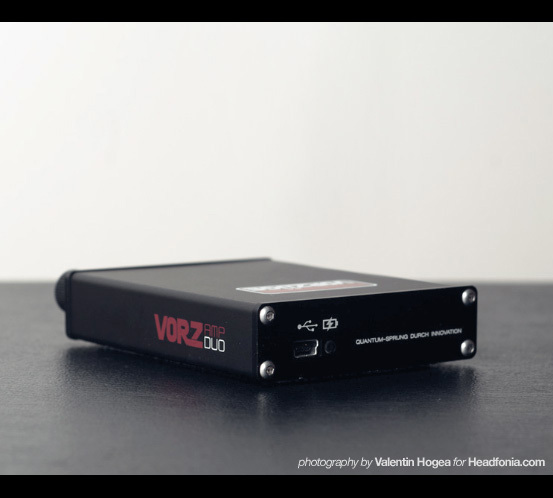 I contacted Vorzüge via e-mail requesting some technical specs for their main products, the two headphone amps VorzAMPpure and VorzAMP Duo. Combining website info with their reply, the amps seemed to be almost identical except for the EQ-function. I’m not going to disclose the information I received, since it contained a confidentiality disclosure agreement, however, let’s put it like this. In a perfect world maybe, but highly unlikely. So I started laughing and thought that all those classes in digital electronics in my distant youth just saved me several hundred dollars. I seemed to listen to music everywhere but, in front of my desktop amplifier. So I – reluctantly – sold off my La Figaro 339 with a whole bunch of tubes and ventured deep into the transportable world. Purchased most of the upper-end amps available. ALO Audio’s The National, The Continental and The Pan Am, Leckerton Audio’s UHA-4, Triad Audio’s L3 and last but not least Vorzüge VorzAMPduo. The quest was to find an amp both suitable for multi-armature high-sensitivity/low-impedance CIEMs as well as orthodynamics, in my case the LCD-2 and subsequently the LCD-3. I must add that I bought the VorzAMP mainly hoping to burst the bubble on all this mysticism. So, heavy negative expectation bias, check. I saw myself probably listening to it, not be that impressed and maybe and in a worst-case-scenario give it to my non-audiophile brother-in-law. Boy was I wrong. Note: I may sometimes refer to the amplifiers in plural, but I have only listened to the VorzAMPduo. Assumptions are based on the fact that only the EQ-part differs between the two amps according to Vorzüge. VorzAMPpure and VorzAMPduo are very-very similar. Their dimensions are 83 x 66 x 18 mm. The Pure weighs 140 g, including dual lithium batteries of 3.7V/1000mAh each, stated to last for 30 hs. The Duo differs from the Pure by having a 2-band EQ, treble and bass, in on/off-configuration, adding 10 g, whilst removing 4hs of battery life. These solid little works of art sets one back 430 and 520 USD respectively. And when I say solid I mean solid. 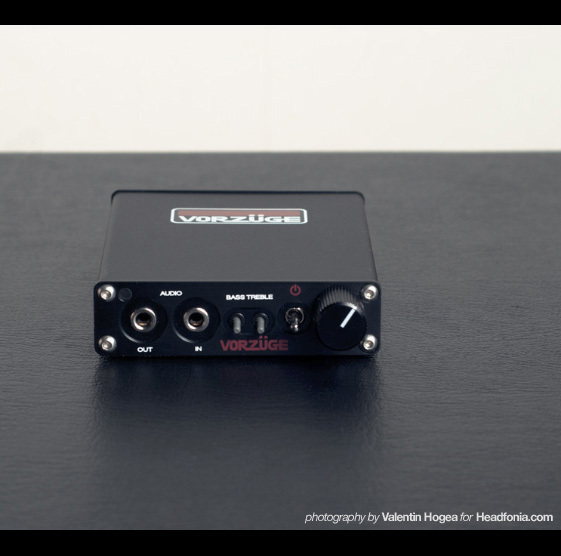 Not like the Triad Audio L3 impresses with its brick-sized manners, the VorzAMP is hands down the most well-built headphone amplifier that I’ve ever listened to. To put it in words is complicated. It’s like explaining the feeling one gets when sitting in a Porsche. All the small details make up the whole. In this case the switches, the non-scratch metal finish, the perfectly printed text, the slightly recessed input/output jacks… I could go on for a while. However, being this small, the layout of the front panel is tight. 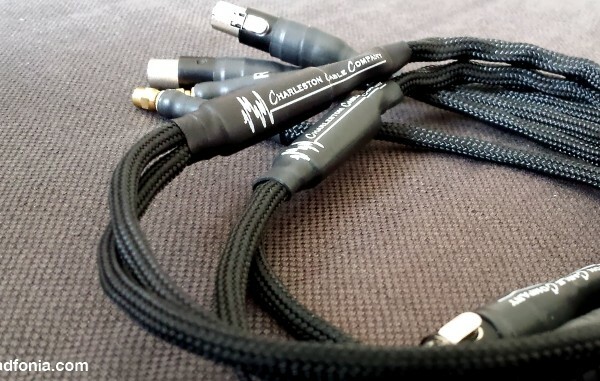 As much as I like the “use every mm”-approach, forget about using two cables with plugs with diameters over 8-9 mm’s. Oyaide and Neutrik plugs are recommended. The supplied “Vorz-cable” with Rean plugs works great, but those straight plugs and a total length of 20 cm ain’t especially pocket-friendly. Supplied is also a quite high quality velour pouch. Nice! Fits the Vorzamp and a smaller source. In my case I keep a headphone-cable rolled up in there. Also supplied is a cheap wall-wart with USB-A output and a USB-A to USB-B-mini (not micro) cable. You don’t have to contemplate about the latter items cheap/poor build quality, since the battery life of 20-25 hs means that you rarely need to use them in the first place. Continued on Page 2, does the inside match the outside? ABOUT THE AUTHOR Valentin is a mid-20’s multi-tasker. Played a lot of instruments from the age of 5-6 and onward. Grew his hair, experimented with 4x12” Mesa Boogies whilst growling in front of a mic. Cut his hair and DJ’d electro beats at clubs. Grew a moustache and people started calling him Dr. Hogea. Has ravaged through all genres you could imagine. A playlist with Warren Zevon, Dissection and Dead Prez is the daily diet. Preferably in a transportable manner. Life is too short for a desk. A Buddy of mine emailed me about a week ago and asked if I wanted to take a listen to this amp. I ultimately passed on it and am thoroughly regretting it. Gosh, I really enjoy your writing style. What a great review! I get so excited when other authors use certain words and phrases that don’t really go togther in the portable amplifier world, such as “Soundstage” and “Big”. When I see those terms near each other, I usually end up getting it. Welcome to the Guest Spot Family. Ed and I serve drinks and cookies on Friday nights. Increased review output and possibly an increase in readership? But i want cookies too! Well, Julius didn’t say you couldn’t attend. Yeah, for all I tell my daughter she needs to learn patience, I need to learn some myself. Since it is actually happening, I’m actually getting a little nervous. Aww! Of Course they can attend. Anyone can! Free Cookies for all! All I need is your social security and credit card number and verification. Oh sure. I will mail them to you, complete with a money order containing my whole bank account. Will that be enough? Great you liked it. Hope we all will find a niche in this good ol’ family. Thanks a million for the kind words. I do my best. It took a while to write, hopefully the next ones goes a bit faster. Looking forward to reading new stuff from you guys! White russians? Maaaaaanly! Bring out the Stroh-rum 160-proof! This review was fun. I could never quite tell if this was a positive or negative review. I know how you feel though. When I saw the film Prometheus last summer, it was maddening. So close to utter brilliance, but a few forehead slapping decisions really shot it in the foot. Seems to be the same here. Here is hoping they take feedback. I am loving these guest reviews. Hope to see another one from you. When perfection is so close, someone just has to mess it up. I just can understand it. Vorzüge are skilled engineers/designers. Who/when/why?… decided to add that moronic EQ? And then non-existant gain-control? It makes baby Jesus cry. It really is a head-scratcher. Those are basics in this age of digital audio. Although, if I ever see someone walking town with the LCD-3 around their head, I will make sure to recommend this to them. And before you say that is crazy, a co-worker of mine, who I have awoken to the world of headphones, says he sees people walking around the university of Minnesota with HD700’s on their head… Connected to ipods… I hope baby Jesus likes to cry, cause it isn’t going to stop. HD700?! Hah.. Beam me up Scotty! I should find this guy. Trade him my HD202 for the HD700. The HD202’s will sound better connected straight to his ipod, so he might go for it. Wow! Almost the perfect one. Now that’s something I have to try listening to. I’m new here, so maybe I don’t yet get the joke — but is English a second language to the reviewers here? I’ve noticed that many reviews posted here are so poorly written (or translated) that it would take Talmudic scholar to figure out what the writer is trying to say. Huh? What does the word “they’re” refer to? Depending on the reference, this could either be a positive or negative statement. Does the reviewer care whether we can tell the difference? I sympathize with the person below that commented “I could never quite tell if this was a positive or negative review.” Maybe if the writer was less interested in verbal masturbation and more interested in stringing together a few, coherent sentences, we would know. Nice to see the ‘con’s with the ‘pro’s. I was looking for something to drive my LCD2s while walking around the house. Seem like this may fit the bill. Esp with 20+ hour battery life! Two questions. Despite the low end EQs odd placement, how does it affect headphones or sources you might consider lacking bass quantity? Also, would you consider the low end more analytic or edging more towards the warmer end? In my honest opinion. It adds a mid-bass hump. Which I really don’t like. It might work with very dry phones, like K701/Q701-ish. However, they’ll probably end up like a muddy HD650. It’s simply too much. I can’t picture one headphone that would really shine with that amount. The low end is warmish, but very good layering. W/o the EQ-bass on that is. Hi Valentin, I’m Yago (previous owner of this VorzAmpDuo for just a few time) but I agree with you in all that you say about this amp. Congratulations for your fantastic review! I read your thorough review and are interested to Vorzüge amp. I wanted to use it for the reader to use AK120 with headphones as K701 or HD650. But also for driving better a IEM as Etymotic ER-4S. You’ve got to use the AK120? What do you think of the synergy? I was thinking of buying the new model Vorzamp Pure II that should have the same sound signature, but that allows to adjust the gain. Do you have any other advice for a truly portable amp? I think the Vorzuges are good for 650s. 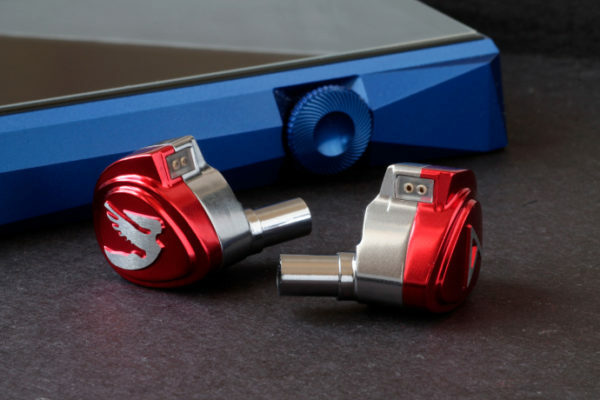 For a thin IEM like the ER4S I’d go for something warmer and fuller on the mids like the ALO International or RSA Intruder. The K701… I don’t have any recommendation for it. I really doubt the integrity of this manufacturer: Why you think they are german? For sure they aren’t (why should shipping to germany then be more expensive than to the US). And what are surprise: Shipping to China is even less. On the website there is no address, no names, no country, no phone number, no email address. Very poor review because of that: When you recommend a product to at least a bit of background research to protect the readers.